The world of fiction is populated with hundreds of different genres — most of which were invented by clever marketeers anxious to ensure vampire novels (teen / horror) don’t live next to classic works (literary) on real or imagined (think Amazon) book shelves. So, it should come as no surprise to see a new category recently emerge: cli-fi. Short for climate fiction, cli-fi novels explore the dangers of environmental degradation and apocalyptic climate change. Not light reading for your summer break at the beach. But, then again, more books in this category may get us to think often and carefully about preserving our beaches — and the rest of the planet — for our kids. A couple of days ago Dan Bloom, a freelance news reporter based in Taiwan, wrote on the Teleread blog that his word had been stolen from him. In 2012 Bloom had “produced and packaged” a novella called Polar City Red, about climate refugees in a post-apocalyptic Alaska in the year 2075. Bloom labelled the book “cli-fi” in the press release and says he coined that term in 2007, cli-fi being short for “climate fiction”, described as a sub-genre of sci-fi. Polar City Red bombed, selling precisely 271 copies, until National Public Radio (NPR) and the Christian Science Monitor picked up on the term cli-fi last month, writing Bloom out of the story. So Bloom has blogged his reply on Teleread, saying he’s simply pleased the term is now out there – it has gone viral since the NPR piece by Scott Simon. It’s not quite as neat as that – in recent months the term has been used increasingly in literary and environmental circles – but there’s no doubt it has broken out more widely. You can search for cli-fi on Amazon, instantly bringing up a plethora of books with titles such as 2042: The Great Cataclysm, or Welcome to the Greenhouse. Twitter has been abuzz. 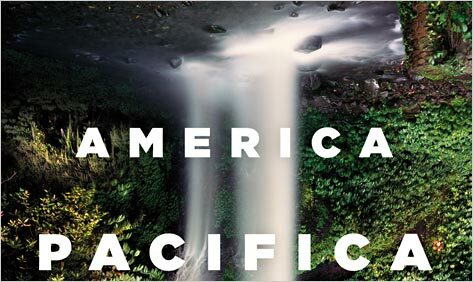 Whereas 10 or 20 years ago it would have been difficult to identify even a handful of books that fell under this banner, there is now a growing corpus of novels setting out to warn readers of possible environmental nightmares to come. Barbara Kingsolver’s Flight Behaviour, the story of a forest valley filled with an apparent lake of fire, is shortlisted for the 2013 Women’s prize for fiction. Meanwhile, there’s Nathaniel Rich’s Odds Against Tomorrow, set in a future New York, about a mathematician who deals in worst-case scenarios. In Liz Jensen’s 2009 eco-thriller The Rapture, summer temperatures are asphyxiating and Armageddon is near; her most recent book, The Uninvited, features uncanny warnings from a desperate future. Perhaps the most high-profile cli-fi author is Margaret Atwood, whose 2009 The Year of the Flood features survivors of a biological catastrophe also central to her 2003 novel Oryx and Crake, a book Atwood sometimes preferred to call “speculative fiction”. Engaging with this subject in fiction increases debate about the issue; finely constructed, intricate narratives help us broaden our understanding and explore imagined futures, encouraging us to think about the kind of world we want to live in. This can often seem difficult in our 24?hour news-on-loop society where the consequences of climate change may appear to be everywhere, but intelligent discussion of it often seems to be nowhere. Also, as the crime genre can provide the dirty thrill of, say, reading about a gruesome fictional murder set on a street the reader recognises, the best cli-fi novels allow us to be briefly but intensely frightened: climate chaos is closer, more immediate, hovering over our shoulder like that murderer wielding his knife. Outside of the narrative of a novel the issue can seem fractured, incoherent, even distant. As Gregory Norminton puts it in his introduction to an anthology on the subject, Beacons: Stories for Our Not-So-Distant Future: “Global warming is a predicament, not a story. Narrative only comes in our response to that predicament.” Which is as good an argument as any for engaging with those stories. All terms are reductive, all labels simplistic – clearly, the likes of Kingsolver, Jensen and Atwood have a much broader canvas than this one issue. And there’s an argument for saying this is simply rebranding: sci-fi writers have been engaging with the climate-change debate for longer than literary novelists – Snow by Adam Roberts comes to mind – and I do wonder whether this is a term designed for squeamish writers and critics who dislike the box labelled “science fiction”. So the term is certainly imperfect, but it’s also valuable. Unlike sci-fi, cli-fi writing comes primarily from a place of warning rather than discovery. There are no spaceships hovering in the sky; no clocks striking 13. On the contrary, many of the horrors described seem oddly familiar. Image: Aftermath of Superstorm Sandy. Courtesy of the Independent. Most of us now carry around inside our smartphones more computing power than NASA once had in the Apollo command module. So, it’s interesting to look back at old movies to see how celluloid fiction portrayed computers. Most from the 1950s and 60s were replete with spinning tape drives and enough lights to resemble the Manhattan skyline. Our favorite here at theDiagonal is the first “Bat Computer” from the original 1960’s TV series, which could be found churning away in Batman’s crime-fighting nerve center beneath Wayne Mansion. The United States government powered up its SAGE defense system in July 1958, at an Air Force base near Trenton, New Jersey. Short for Semi-Automatic Ground Environment, SAGE would eventually span 24 command and control stations across the US and Canada, warning against potential air attacks via radar and an early IBM computer called the AN/FSQ-7. Fronted by a wall of dials, switches, neon lights, and incandescent lamps — and often plugged into spinning tape drives stretching from floor to ceiling — the AN/FSQ-7 looked like one of those massive computing systems that turned up in Hollywood movies and prime time TV during the ’60s and the ’70s. This is mainly because it is one those massive computing systems that turned up in Hollywood movies and TV during the ’60s and ’70s — over and over and over again. Think Lost In Space. Get Smart. Fantastic Voyage. In Like Flint. Or our person favorite: The Towering Inferno. That’s the AN/FSQ-7 in The Towering Inferno at the top of this page, operated by a man named OJ Simpson, trying to track a fire that’s threatening to bring down the world’s tallest building. For decades, the AN/FSQ-7 — Q7 for short — helped define the image of a computer in the popular consciousness. Nevermind that it was just a radar system originally backed by tens of thousands of vacuum tubes. For moviegoers everywhere, this was the sort of thing that automated myriad tasks not only in modern-day America but the distant future. It never made much sense. But sometimes, it made even less sense. In the ’60s and ’70s, some films didn’t see the future all that clearly. Woody Allen’s Sleeper is set in 2173, and it shows the AN/FSQ-7 helping 22nd-century Teamsters make repairs to robotic man servants. Other films just didn’t see the present all that clearly. Independence Day was made in 1996, and apparently, its producers were unaware that the Air Force decommissioned SAGE 13 years earlier. Of course, the Q7 is only part of the tale. The history of movies and TV is littered with big, beefy, photogenic machines that make absolutely no sense whatsoever. Sometimes they’re real machines doing unreal tasks. And sometimes they’re unreal machines doing unreal tasks. But we love them all. Oh so very much. Mike Loewen first noticed the Q7 in a mid-’60s prime time TV series called The Time Tunnel. Produced by the irrepressible Irwin Allen, Time Tunnel concerned a secret government project to build a time machine beneath a trap door in the Arizona desert. A Q7 powered this subterranean time machine, complete with all those dials, switches, neon lights, and incandescent lamps. No, an AN/FSQ-7 couldn’t really power a time machine. But time machines don’t exist. So it all works out quite nicely. He noticed the Q7 in TV show after TV show, movie after movie — and he started documenting these SAGE star turns on his personal homepage. In each case, the Q7 was seen doing stuff it couldn’t possibly do, but there was no doubt this was the Q7 — or at least part of it. 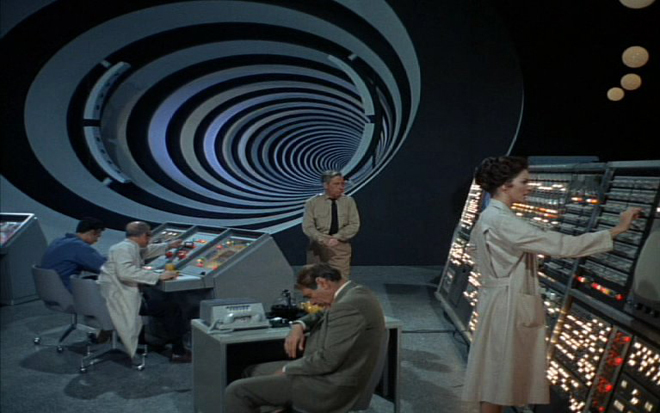 Here’s that subterranean time machine that caught the eye of Mike Loewen in The Time Tunnel (1966). The cool thing about the Time Tunnel AN/FSQ-7 is that even when it traps two government scientists in an endless time warp, it always sends them to dates of extremely important historical significance. Otherwise, you’d have one boring TV show on your hands. Hot on the heals of our look at literary deaths we look specifically at the greatest suicides in literature. Although subject to personal taste and sensibility the starter list excerpted below is a fine beginning, and leaves much to ponder. 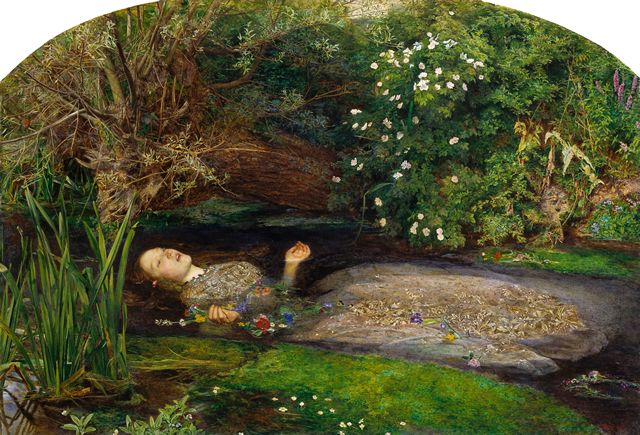 Hamlet’s jilted lover Ophelia drowns in a stream surrounded by the flowers she had held in her arms. Though Ophelia’s death can be parsed as an accident, her growing madness and the fact that she was, as Gertrude says, “incapable of her own distress.” And as far as we’re concerned, Gertrude’s monologue about Ophelia’s drowning is one of the most beautiful descriptions of death in Shakespeare. In an extremely dramatic move only befitting the emotional mess that is Anna Karenina, the heroine throws herself under a train in her despair, mirroring the novel’s early depiction of a railway worker’s death by similar means. Eugenides’ entire novel deserves to be on this list for its dreamy horror of five sisters killing themselves in the 1970s Michigan suburbs. But the death of the youngest, Cecilia, is the most brutal and distressing. Having failed to kill herself by cutting her wrists, she leaves her own party to throw herself from her bedroom window, landing impaled on the steel fence below. In life, Emma Bovary wished for romance, for intrigue, to escape the banalities of her provincial life as a doctor’s wife. Hoping to expire gracefully, she eats a bowl of arsenic, but is punished by hours of indelicate and public suffering before she finally dies. This is the first suicide that many students experience in literature, and it is a strange and calm one: Edna simply walks into the water. We imagine the reality of drowning yourself would be much messier, but Chopin’s version is a relief, a cool compress against the pains of Edna’s psyche in beautiful, fluttering prose. Tim Lott over at the Guardian Book Blog wonders which are the most dramatic literary deaths — characters rather than novelist. Think Heathcliff in Emily Brontë’s Wuthering Heights. What makes for a great literary death scene? This is the question I and the other four judges of the 2012 Wellcome Trust book prize for medicine in literature have been pondering in advance of an event at the Cheltenham festival.